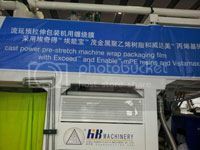 Chinese machine maker Xinle Huabao Plastic Machinery claims to have increased the output of its five-layer cast line running a "tough cast power" pre-stretch machine wrap packaging film from 450 to 650 kg/hour, by running ExxonMobil Chemical's Exceed and Enable metallocene polyethylene (mPE) resins and Vistamaxx propylene-based elastomer (PBE). Said General Manager Guoliang Ma, "We sell not only the machine but the entire stretch film solution to customers. Furthermore, Xinle is the machine supplier that has the formulation for the power stretch film, so that we are able to resolve film quality issues and improve processability." Xinle had a turnover of RMB120 million last year and expects a 20% increase this year, mainly due to the ExxonMobil Chemical’s solutions, said Ma. Xinle exports half its output to countries like the US, Brazil, Mexico, Turkey, Iraq, Russia, Malaysia and South Korea. ExxonMobil Chemical has had various success stories in China and for this reason is seeing a 15% growth for its mPE business, compared to the general PE market, according to Thomas Deman, PE Global Marketing Manager, ExxonMobil Chemical. "By adding the elastomers into mPE formulation, the processor is able to downgauge by up to 40% to 15-20 microns (instead of the usual 20-25 microns); plus the film is able to be pre-stretched by up to 250% (hence the term used tough cast power)," said Deman. Furthermore, Deman says the elastomers add value to the film. "Vistamaxx PBE provides the cling requirement at a much lower dosage of 4% when used with LLDPE, compared with up to 50% for ULDPE." A typical five-layer cast power pre-stretch film structure includes the 96-100% LLDPE (in the outer layers), 100% mPE resins (in the inner layers), with 4% Vistamaxx PBE. "Besides allowing for a more sustainable production, it is also more energy efficient; results in significant cost savings plus the film produced is not only thinner but tougher and with improved optical properties," reiterated Haridass Kalidas, Asia Pacific PE Market Development Manager . Ashok Sapaliga, Asia Pacific Market Development Manager for Vistamaxx in Film says the company has a two-way approach to the market. "We set solutions for customers and want to go beyond the product. 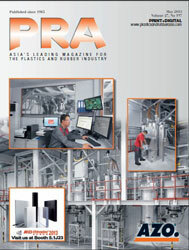 Our goal is to help customers create high performance sustainable end products."